I finally finished my favorite HQ/Special Character in my Ultramarines Army. 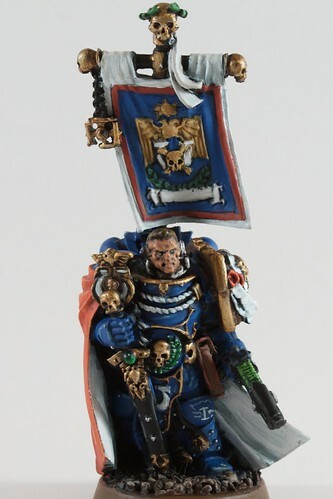 This guy was a blast to paint, however I have been very intimidated about the banner. However, it only took me a short bit to do the banner, and I am happy with it. Across the table, this looks great (IMHO!). I do need to paint his name on the banner, which intimidates me even more! I will post more pictures of my Ultramarine army soon as it is closer and closer to becoming complete. In fact, I've even started to *gasp* like banners.